Rose-Kim Knits: Spin In and Knit In and Knitbuds, Oh My! Spin In and Knit In and Knitbuds, Oh My! Yesterday I went to the Spin In at Weaving Works. It was mainly the regular crowd and we're all getting to know one another a lot better. We also finally wore name tags so we could learn one another's names. One woman who comes very often raises angora rabbits. She's always spinning these gorgeous fluffy batts of fiber. She brings extras to sell. A week ago she brought three new baby bunnies with her too to show off. Yesterday she and I went out to lunch together midway through the spinning. I was peppering her with lots of questions about her bunnies and how she keeps them and where, etc. This was when she very casually mentioned that she also has two alpacas! In the city! I got her number so I could bring Wes and the boys over to meet her animals. I've been telling Wes all about them and how easy they are to care for. I'm not sure if he's buying it yet. I had a pretty productive day and spun nearly all of my Ashland Bay multi-colored merino. 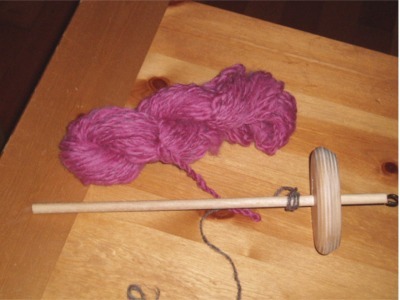 I want to make a sock yarn and am spinning hoping for a 3-ply. I pulled off a little sample and it seemed sturdy but soft and the right size. We'll see. As soon as spinning wrapped up I headed to TMK's house for Ryan's Dulaan Knit In. When I got there the party was in full swing. There were lots of knitters, loads of food and a mountain of donations for Dulaan. I gave Ryan everything I had been storing up including old shop samples, socks the boys outgrew and lost and found items that had never been claimed. I forgot to make a note of how many hats, socks, etc. I knit before I tossed them in the pile. I stayed and worked on a simple sock from my Denmark leftovers. As things started to wind down I moved on to location #3, Starbucks. I met up with a few knitbuds and we knit until closing. I finished the first sock and started a pair of felted mittens from some crazy handspun I made last fall. I cast on the second sock this morning and knit the ribbing and half the leg on a trip to Costco. Let's hear it for multi-tasking.